Indian Submarine S21 Captain Rann Vijay Singh, Lieutenant Arjun Verma and Officer Devraj along with team fight back the Pakistani war submarine PNS Ghazi and safeguard Indian coast. One line Review: The first war at sea film is an edge of the seat thriller, manages to keeps you completely hooked. Positive Points: The film is a brave attempt on part of the makers. The performances and technical detaining score full points. The gripping plot and story line are its strength. The movie is a nail biting thriller and successfully keeps the viewers hooked throughout, creating the right intensity and tension. Veteran actor Om Puri’s last movie 'Mr. Kabaadi' to arrive in cinemas on 8th September! 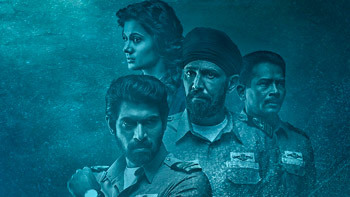 The Ghazi Attack Remains Steady At The Box-office!